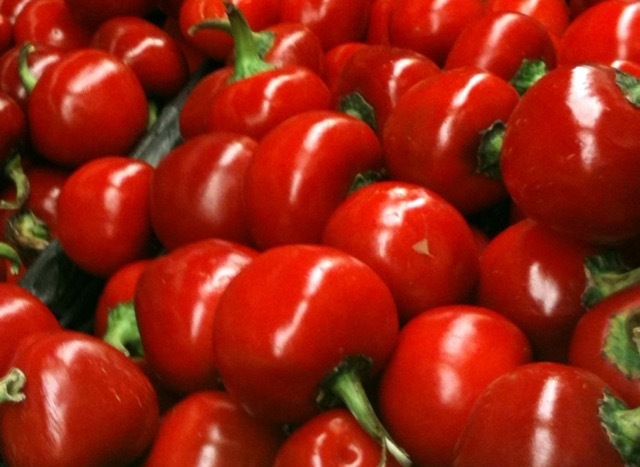 Pimento or Cherry Pepper is a cultivar of sweet pepper of the species Capsicum annum. It’s a large heart shaped red sweet pepper, 3-4″ x 2-3” (8-10 x 5-8cm). The flesh is thick and succulent (meaty) and more flavourful and aromatic than bell pepper. It’s good for roasting. Large bell peppers are sometimes packaged as Pimentos but true Pimentos are more tomato-orange and bell peppers are bright red in colour. Spanish green olives are stuffed with pimento pepper. Pimientos are commonly used for making pimento cheese. They are also used for making pimento loaf, a type of processed sandwich meat. Also used in several dishes, especially salads and pizzas. The term ‘pimiento’, from the Spanish for “pepper,” is also applied to several cultivars of the sweet Capsicum annuum that possess a distinctive flavour but lack pungency (Encyclopaedia Britannica). The name “pimento” is also used for the unrelated allspice tree (Pimenta dioica). Next What is Pimento Stuffed Olives?